Tiger’s Clough is a small waterfall on the lower slopes of Rivington Pike. It can be reached by a short walk along the wooded ravine formed by the River Douglas. This can be a bit muddy in places but is quiet even on a Bank Holiday. 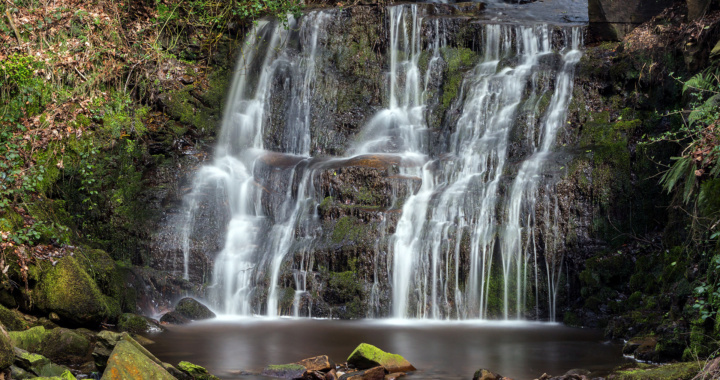 There are two waterfalls in the ravine, the main one being Tiger’s Clough Waterfall and the more slender Crooked Edge Waterfall, both close together. The main path does not visit the falls, but takes a route higher up the side of the ravine, so it is possible to pass by without seeing the falls at all – as we did, before we realised we had gone too far and retraced our steps! Parking is available in a small cul-de-sac at the Rivington and Blackrod High School in Horwich or a little further on in the Rivington Park car park. From the Rivington Park car park, walk south towards the Rivington and Blackrod High School, past the school tennis courts, then take the lane up the hillside immediately after the tennis courts. Continue up the hill, and when the lane splits, keep to the right, passing through a gate onto the open hillside. Just after this, take the kissing gate on the right which leads to a footpath which descends towards the River Douglas. When the river comes into sight, there is another kissing gate on the right and steps that descend to a footbridge over the river. Ignore this gate and instead take the indistinct path right that descends towards the river immediately after the gate. Follow the river upstream on the left bank and Tiger’s Clough Waterfall will soon come into sight just after the river splits into two branches. Posted in Lancashire and tagged Waterfall.